Once Sikkim was an independent monarchy under Namgyal Kingdom. In May 1975 it joined India and became the 22nd state. The tribal community Lepchas are the original inhabitants of Sikkim. While the real origin of Lepchas are yet to be established, many consider they are clan of Nagas while others think they are Mongolian in origin... but Lepchas themselves believe they always belonged to Sikkim. However the Lepchas (about 13% of Sikkim's present population) were later outnumbered first by immigrant Bhutias (about 16% of population) who came from neighboring Tibet (now part of China) and then immigrant Nepalese (about 67% of population) who mainly came in from Nepal. Gradually over time many others from all over India such as Marwaris, Bengalis, Punjabis, Biharis etc came and settled down in Sikkim having set up their businesses or joined government services, or getting involved in construction of roads and buildings. So you can see a fusion of many cultures and traditions in Sikkim, but the state has all along remained exceptionally peaceful and friendly. People of Sikkim are collectively known as Sikkimese. It is estimated that resident population of Sikkim today well exceeds 6,50,000. It's worth noting that number of tourists visiting Sikkim annually has exceeded 14 lakhs, so you can imagine how the total population of the state gets inflated by tourists. There are mainly three ethnic communities within Sikkimese - Lepchas, Bhutias and Nepalese. However there are several communities within Nepalese themselves based on their cast systems, and two major groups within Bhutias who are mainly Buddhists (although there are other sub groups). Lepchas worship nature (mountains, forests, rivers etc) and were not originally associated to any religion as such and rather practised animism. However today many of them practise Christianity and some Buddhism. When the British missionaries came to Sikkim in 1800s, many Lepchas were converted into Christians. Lepchas are peace loving and believe in healthy & simple living amidst nature. They have their own language ('Lepcha') and scripts. The script is not quite well developed but it's rich on flora & fauna. Although not quite common these days, Lepcha community system allows women to have more than one husbands (that is a practice of polyandry). Main occupation of Lepchas is agriculture (mostly cultivating cardamom, paddy and oranges) although some have gone into services and business today. They were earlier poor agriculturists and could manage to somehow grow rice, brinjal, corn, capsicum, cucumber and few other vegetables. And they moved from one place to the other within 3 years, building a new house and starting life all over again. The traditional Lepcha houses are supposed to be quake proof and made using bamboo and wood with complex set of hinges and sockets. They are usually 4 to 5 ft high and rectangular in shape. The traditional dress of a Lepcha male is known as 'Pagi' which comprises of a robe made of striped cotton, a half pajama and a hat. The women wear 'Dumbun'... a two-piece dress comprising of full-sleeve loose blouse and a skirt with a belt. Ladies ornaments includes earrings, bracelets and necklaces. Men usually carry a multi-purpose knife and women a sickle attached to their belts. The Lepchas are good at sports especially in archery. They are also expert in weaving and hand crafting. Rice is the staple food of Lepcha although maize, buckwheat are also popular. A traditional drink is 'Chi' or 'Chaang' which is a warm beer produced from fermenting millet and served on a bamboo tumbler and to be taken using a bamboo straw. Some nice Lepcha traditional dishes includes 'Phapar' - rolls made of buckwheat and usually filled with spinach or mustard leaves & vegetables and served on banana leaf, 'Iskus Munta' - a dry vegetable preparation served on squash leaf, 'Ningro Churpi' - made out of fiddle-head fern and cheese (churpi), and then there are dishes made with bamboo shoots. They also make nice mutton curry... preparations are all quite non-spicy compared to Nepali and Bhutia food. Read: Traditional food & drinks of Sikkim to know about the different exotic cuisine of Sikkim. There is a quaint village in central Sikkim (on the way to north Sikkim) known as Dzongu Valley which has been preserved for Lepchas (a special permit is required to visit). The village showcases traditional Lepcha lifestyle amidst wonderful nature and views of mountains. Few Lepcha families here run home stays for tourists to experience true Lepcha lifestyle, culture and authentic Lepcha food. Read: Dzongu Valley - Visit The land of Lepchas to know about the village and how to visit. Bhutias in Sikkim originate mainly from Tibet and predominantly follow Buddhism as their religion. They mostly migrated to Sikkim in early 17th century when there was a serous conflict between the Yellow Hat and Red Hat Buddhist sects in Tibet. Like British missionaries who converted many Lepchas into Christians, the Bhutias too tried to convert Lepchas into Buddhists and succeeded to some extent. You can find Bhutias mostly in north Sikkim and there they are known as Lachungpas (those who live in Lachung area) and Lachenpas (those who live in Lachen area). Bhutias speak a dialect of Tibetan language known as Bhutia language or Lhokey. Monasteries play a central role in the social and spiritual life of Bhutias. 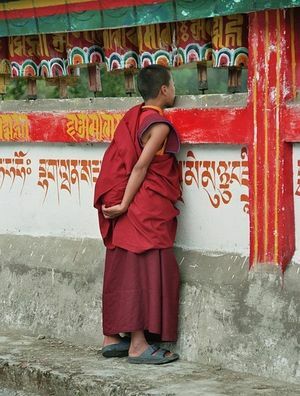 It is common that one male member from the family (usually the second son) would join a monastery as a lama (monk). The main deities of Bhutias are Buddha and Bodhisattvas. 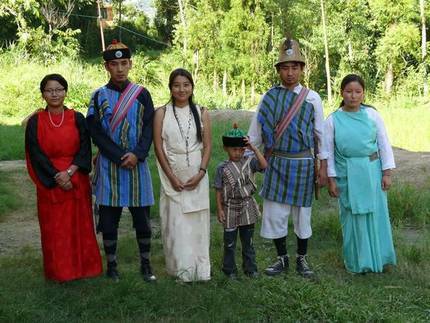 There are mainly two groups among Bhutias... Tong-du-ruzhi with four clans and Bed-tsen-gyed with eight clans. There are other sub-groups too. Men wear a full sleeved coat (Kho) with shirt, a waistcoat (JyaJya) with a cloth-made belt (Kera) and a cap (Shambo). Women wear a full sleeve blouse (Teygo) and a loose coat (Kho), cap and shoes. Married women usually wear a striped apron around their waist. Gold jewelry studded with stones are very popular among the Bhutia women... ornaments include earrings, necklaces, gold bangles, rings etc. Bhutia women are well known for excellent carpet weaving and men for handicrafts. Many also engage in agriculture which was their original livelihood. Their basic food comprises of rice and meat (usually pork or beef, occasionally chicken and mutton as well). Some of the other popular food among them are thukpa (a kind of soup), momos, noodles in a broth etc. So how and when did the Nepalese come to Sikkim? In fact even in 1642 when the Namgayal dynasty was founded in Sikkim there were several Nepalese people belonging to casts like Gurung, Limbu and Magar already living in Sikkim. But the major influx of Nepalese took place when the Gorkha rulers of Nepal captured parts of western Sikkim in 17th and 18th century. However later the British defeated Nepalese and in 1817 Sikkim was returned to the Namgayal king through the Treaty of Titalia between King of Sikkim and the British. So all the Nepalese already settled in Sikkim became part of the kingdom of Sikkim. Ministers in the dynasty later started inviting Newars (belonging to business class of Nepalese) who had skills to mint coins and build houses. The Newars in turn brought in many other Nepalese belonging to other service casts such as Bahuns (Brahmins), Chhetris (Khsatriyas), Kamis (smiths), Damais (tailors), Sarkis (cobblers), Dhibis (washerman) etc. The Nepalese in Sikkim made a major contribution in agriculture... they introduced Terraced Farming on the hill slopes leading to large scale utilization of land and production of crop such as maize, rice, cardamom, ginger etc that significantly helped in revenue generation. Many Nepalese also ventured into businesses. Today the Nepalese of Sikkim are spread through out the state. They speak Nepali language which is quite similar to Hindi. Most Nepalese follow Hindu religion except the casts Tamang and Sherpas who are mostly Buddhists (although some follow Hinduism). National outfit of Nepalese men is known as 'Daura Suruwal' - a full sleeve garment up to knee level (kurta) with a jacket and a trouser. Traditional dress of Nepali women is known as 'Kurta Suruwal' which is a combination of a loose baggy trouser with a long cotton top and a large scarf. 'Sari' is another traditional dress of Nepalese women which is often worn during special events like marriages and festivals. Sari is a piece of long cloth draped around the body and worn with a blouse. Nepali men usually carry a 'Khukri' - a traditional knife kept in a leather or wooden case. However note that traditional ethnic attire of both Nepalese men and women vary between their communities. 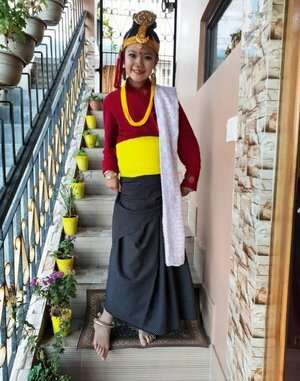 For example Tamang women wear a blouse (usually ted or black in color), a cloth piece wrapped around the waist and a cloth belt (patuka) supporting it. Nepalese are mostly rice eaters. Dal, Bhat, Tarkai (lentil soup, rice and vegetable curry) are widely taken as part of regular meals by the Nepalese. And that is usually accompanied by condiments such as pickles, green chili etc and side dishes such as curried chicken or mutton. However the fusion cultures in Sikkim has made the Lepcha and Bhutia cuisines popular with Nepalese as well.